Non Smoking, beautifully presented and fastidiously clean accommodation worthy of a 5 star rating. Located in the historical borough of Harrow a leafy residential suburb in NW London. The house is bright comfortable and tastefully modernized with free WiFi. The kitchen is fully tiled with ceramic floor and granite surfaces including the kitchen table which provides an informal eat-in option. There is a washer/dryer induction hob/stove and convection oven. The living area has a flat screen TV and leads to an open dining room for formal dining and seating up to 6 people. The bathroom is finished to a high standard. Tastefully decorated in a classic English style with bit of european practicality thrown in for good measure; a bidet provides an additional level of cleanliness!. The house has 3 bedrooms and comfortably sleeps 5 people. All bedrooms have fully fitted wardrobes with floor to ceiling doors. Enjoy the best of both worlds. A great location for exploring the hustle and bustle of London town or relax by exploring the quintessential English countryside. You will find that you are ideally located for both. Well connected for buses, underground, trains and airports (Heathrow and Luton airport especially). In fact this would be a great base for exploring more cities in continental Europe. St Pancras station is 15 minutes away so a day trip to Bruges (in Belgium) or a mini stay in Paris on the fast new Euro-Star train is very feasible. If you are a Harry Potter fan, we are also close to the Warner Brothers Studio in Leavensden where all 8 Harry Potter films were made. Enjoy a tour and pick up a souvenir. I like meeting new people and hearing their stories. It is on a quiet tree lined street, with ample on street parking. The house is bright and airy and gives you a sense of space the minute you walk in. Floor to ceiling tiled bathroom. A clean-mordern-quiet nest in the middle of bustling Harrow. We thorough enjoyed our stay here. The place is in a quiet neighborhood of a bustling Harrow. It is less than 10 minutes walk from shops, bakeries, markets, and other convenience. The place is very clean, well equipped, nicely decorated. Parking for one car is no problem whatsoever. Fabulously Clean and Comfortable 3 bedroom house. Your Home away from Home. Located in the historic borough of Harrow. Our house is close to all amenities, great restaurants, fabulous supermarket (Waitrose) and excellent transportation system. The hustle and bustle of London is only 12 mins away when you take the super fast train to Euston. At the end of a busy day sight seeing, return to the tranquillity and comfort of a home that feels inviting and cosy. 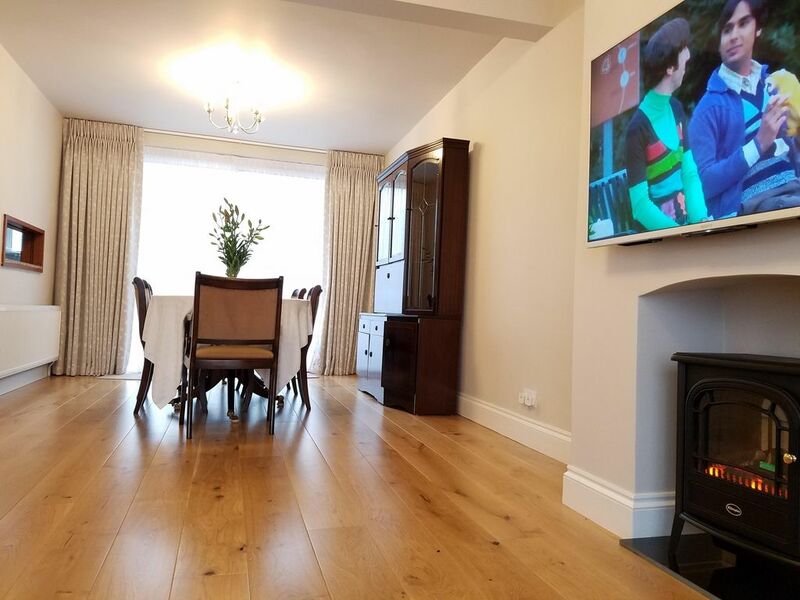 The house is bright comfortable and recently re-modernised to a high standard. All bedrooms have fully fitted wardrobes with floor to ceiling sliding mirror doors. The kitchen is fully tiled with ceramic floor. You have use of a washer/dryer hob stove and convection oven. All surfaces are granite including the kitchen table which provides an informal eat-in option. The living area has a flat screen TV and leads to an open dining room for formal dining and seating up to 6 people. The bathroom is also fully tiled and finished to a high standard. Tastefully decorated in a classic english style with bit of European practicality thrown in for good measure; a bidet provides an additional level of cleanliness!. It comfortably sleeps 5 people. Better and more spacious than a 4 star hotel. Well connected for buses, underground, trains and airports (Heathrow and Luton airport especially). In fact this would be a great base for exploring more cities in continental Europe (choose air or train, St Pancras and the Euro-Star is a 15 min train ride away).